Address : 18370 CHATEAUMEILLANT CHER (FRANCE). Photography : © CARRE D'ARCHE. 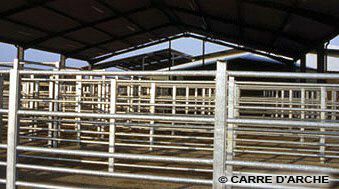 Three buildings form this cattle market. 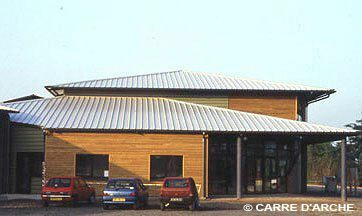 A principal volume houses the auction room, the administration facilities and refreshment room and forms the articulation between the sales staff area and the buyers area. Situated along an avenue, the ensemble is underligned by a low hedge. 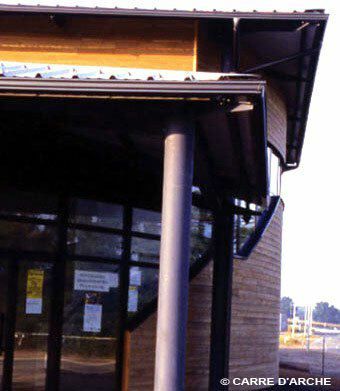 The building, built using a steel frame and masonry, is clad in pressure-sealed Douglas pine with a roof in profiled metal sheeting.